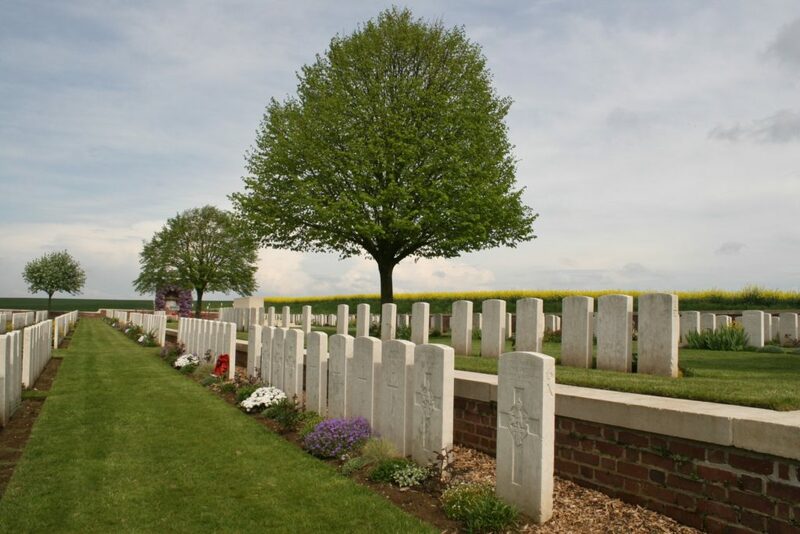 A beautiful spring afternoon in Dantzig Alley British Cemetery. 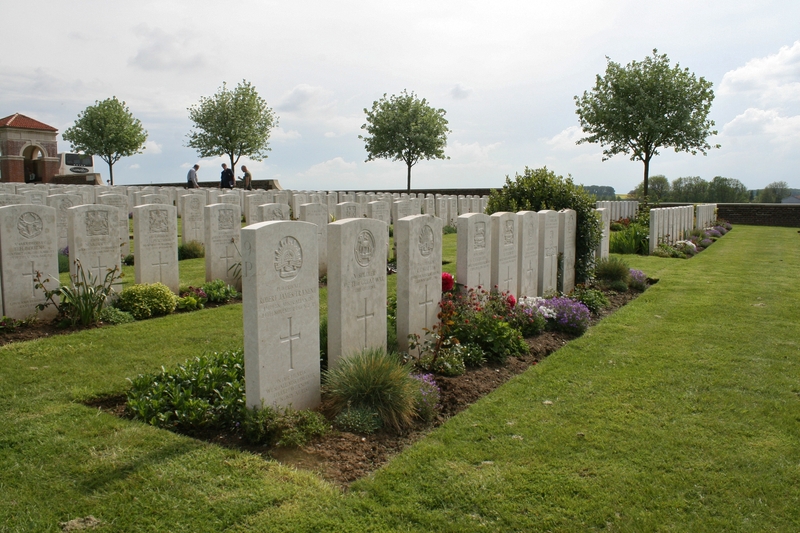 …but with an evening in Amiens beckoning, and as these are not full tours of the Somme cemeteries (unlike our visits to those in Flanders), I was happy enough to have the opportunity to spend even a few minutes here. 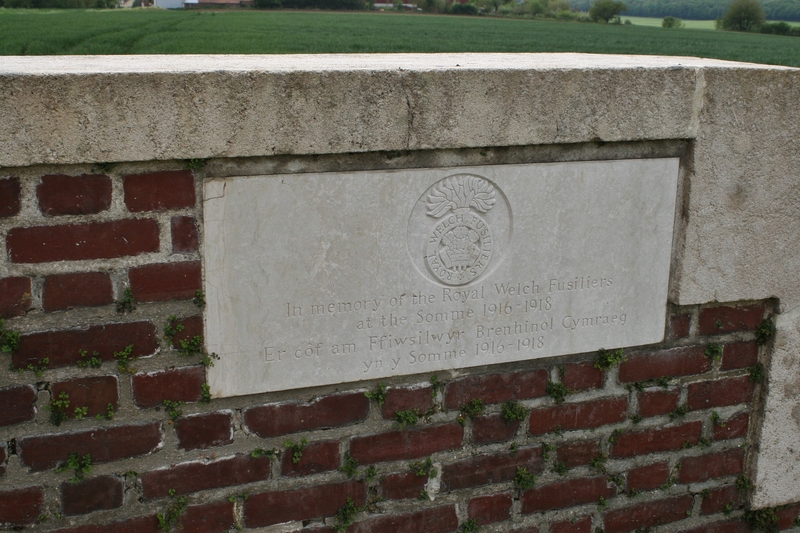 …and a few moments reflection at this little plaque, inlaid in the cemetery wall near the entrance, to the memory of the Royal Welch Fusiliers killed on the Somme between 1916 and 1918, before we had to head for wives and hotel. 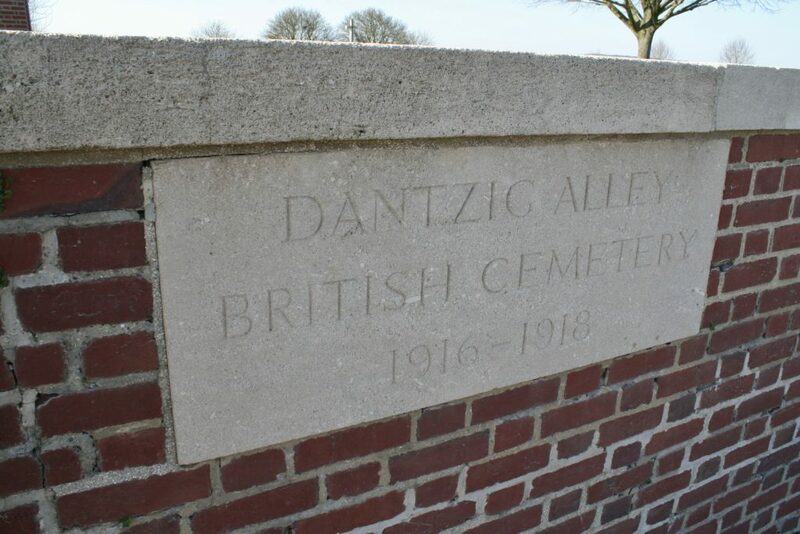 Little did I know at the time that a return visit to Dantzig Alley would reward me with what I suspect will be the most emotive find I am ever likely to unearth on the battlefields. 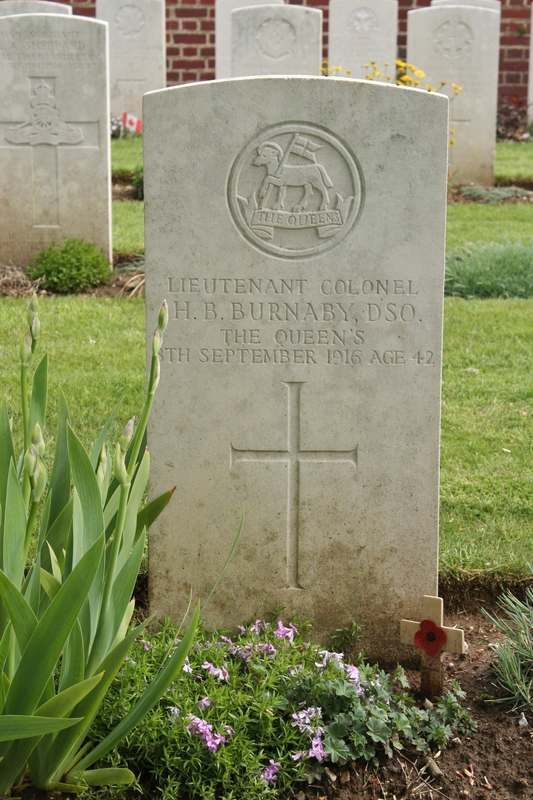 …this time on my first ever organised tour (with the Friends of Surrey Infantry Museum), one of our party wanting to visit the grave of a Queen’s (Royal West Surrey Regiment) officer, Lieutenant Colonel Hugo Beaumont Burnaby D.S.O. And thank goodness he did, as you’ll find out later. …and wander further afield. Ninety four identified men of the Queen’s, all of whom were killed on 1st July, are buried in this cemetery; it seems highly likely that the six unknown privates whose graves are pictured above lost their lives that day too. The South Staffordshire men in the row behind, attacking a little to the left of where the Queen’s, who were in support, would advance, also died that same morning. Dantzig Alley was the name of a long German trench attacked, to the east of Mametz, by the 2nd Bn. 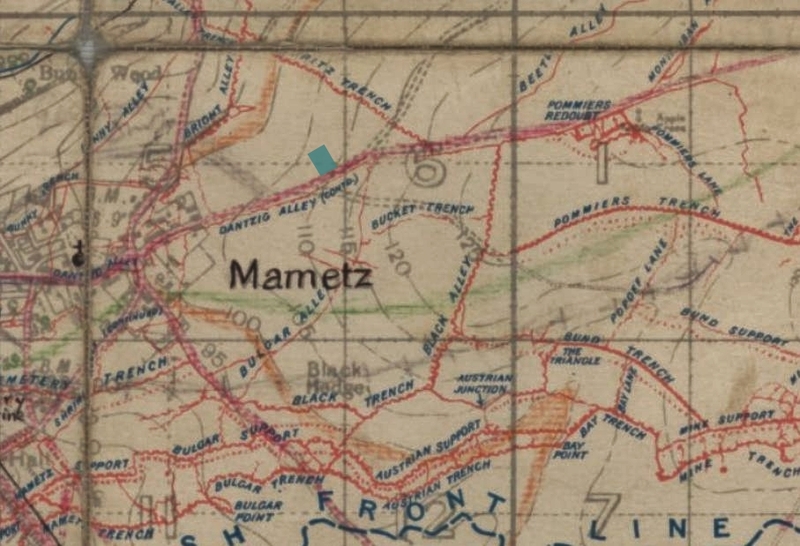 The Queen’s, among others, on the morning of 1st July 1916, and is clearly marked on the 1916 trench map (above), as is Mametz village itself. If you take a quick look at Google Maps (or your map provider of choice), you’ll see that the trench follows exactly the line of the modern road, having been dug alongside it at the edge of the rapeseed field you can see in the previous two photographs. Dantzig Alley British Cemetery (marked in green on the map), or at least the raised section of it, is a battlefield burial ground (note the less structured appearance of the rows of headstones in the background of the previous photo), begun in the early days of July, and used until November, after which, for the moment, the tide of war turned east, and the cemetery ceased to be used. 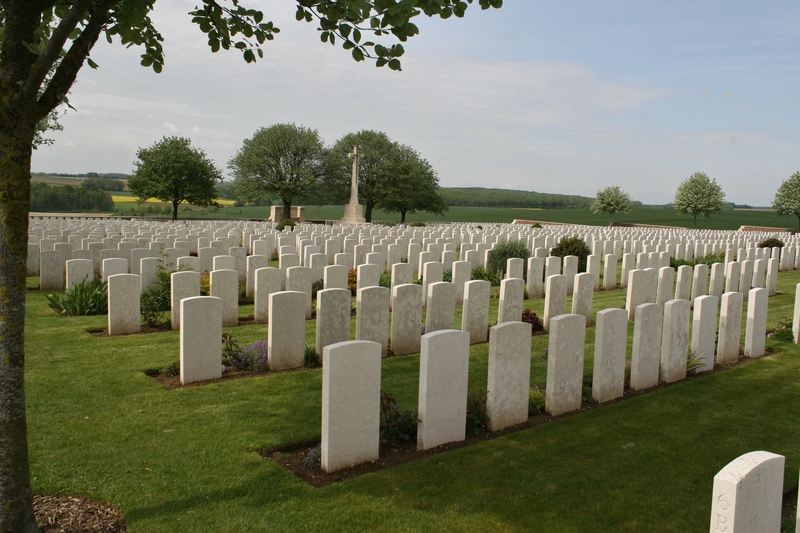 Eleven more identified graves were added during the battles of autumn 1918, but by the end of the war the cemetery still contained only 183 graves, all now in Plot I (the raised section). 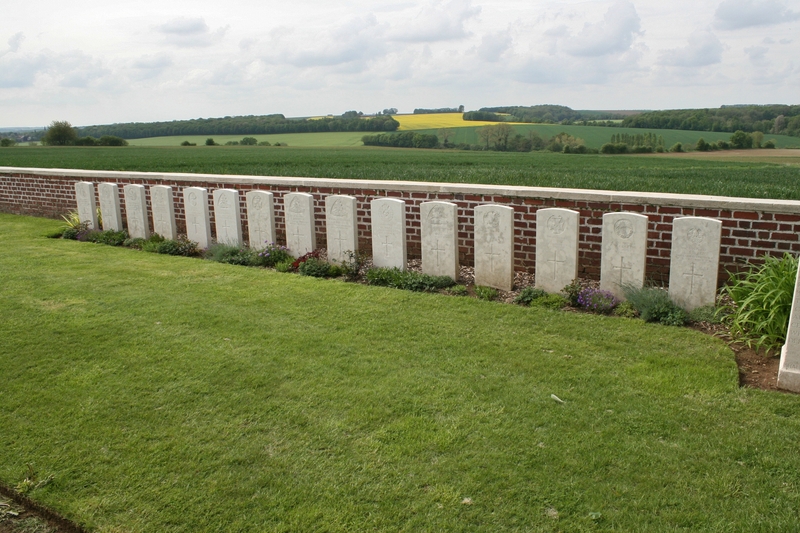 North westerly view looking towards the Cross of Sacrifice from the centre of the cemetery. 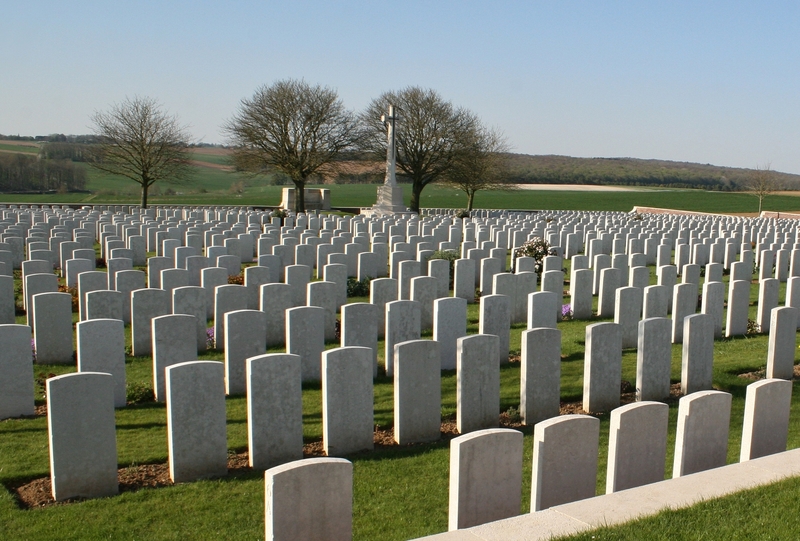 After the Armistice the cemetery was greatly enlarged as men, the majority killed in July 1916 and buried at the time on the battlefields around Mametz and in a number of smaller nearby cemeteries that were subsequently erased, were reinterred here. More than 2000 men now lie here, a quarter of whom are unidentified; 714 of the identified burials are men killed on 1st July. Before we go further, here’s the cemetery plan, courtesy, as always, of those nice people at the CWGC. A row of officers, all from, or attached to, the 2oth Bn. Manchester Regiment, all killed in action to the west of Mametz on 1st July, and all originally buried elsewhere before being reburied here (see graves registration report form below) in Plot VI. 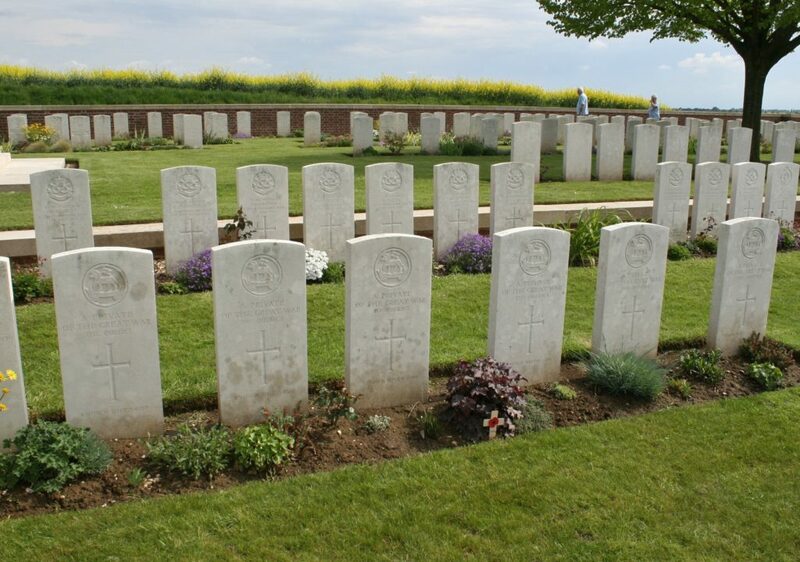 The row includes their commanding officer, thirty five year old Lieutenant Colonel Harold Lewis (twice Mentioned in Despatches) at one end, and let’s not forget the unknown soldier at the other. 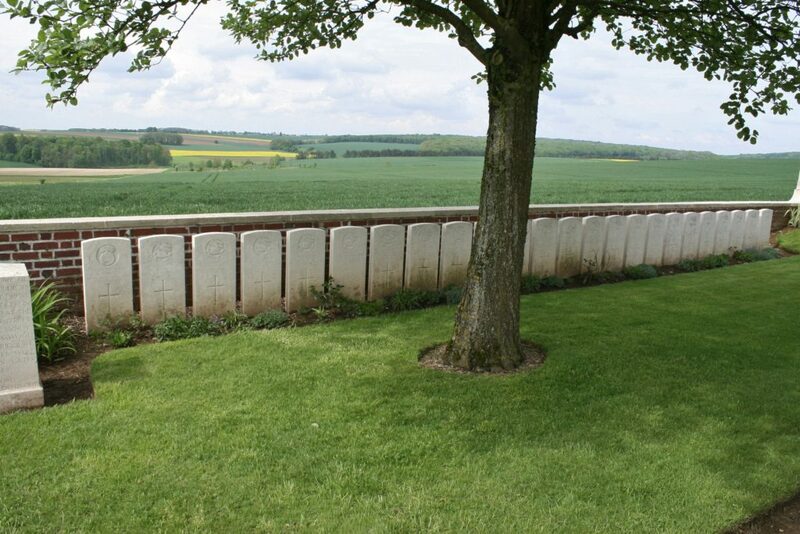 Looking north east; Fritz Trench which, along with Bright Alley and Bunny Alley (see trench map), comprised the Queen’s’ second objective for the day, after Mametz village and Dantzig Alley had been taken, ran diagonally across the fields not far beyond the cemetery. Despite heavy losses, by mid-evening of 1st July all of 7th Division’s objectives, including the capture of Mametz, had been achieved. In every cemetery you’ll find a Boyd. Not exactly true, but the Boyd clan stretches far and wide, and it sometimes seems like it. 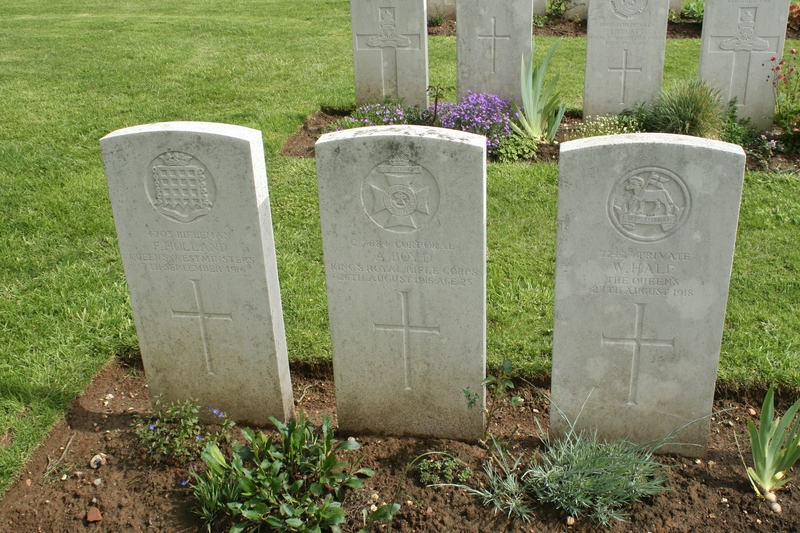 These three men were victims of the fighting in late August and early September 1916. Along the northern boundary, a second memorial, this time a stone seat, to the Royal Welch Fusiliers. …a Duhallow* Block remembers seventy British soldiers buried elsewhere in 1916, whose graves were subsequently lost. *a reference to Duhallow A.D.S. 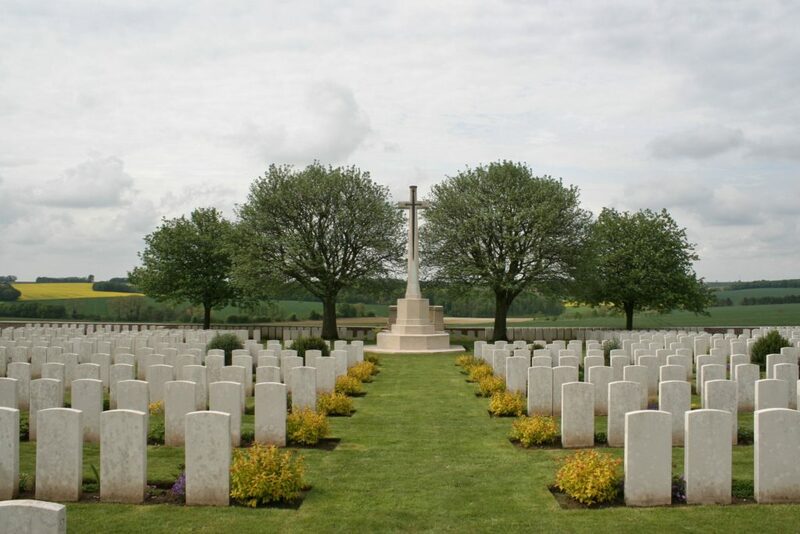 Cemetery just a little to the north of Ieper (Ypres), where these blocks were first introduced, and where, if you click the link, you will be magically transported. 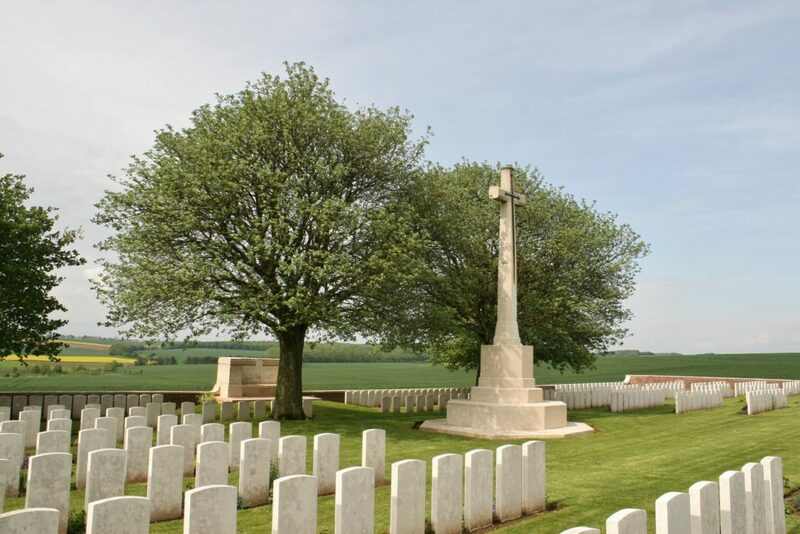 …a good number of the unidentified men buried here at Dantzig Alley must have originally been buried in both Vernon Street and Bottom Wood Cemeteries and then also moved here. By the way, the wood in the left background above is Fricourt Wood, Mametz Wood is beyond the tree in the previous photograph, and the much smaller Bottom Wood can be seen beyond the Duhallow Block two photos previously. Duncan peers over the boundary wall. I’d mentioned to him earlier that it was worth doing on occasions. You never know what you might find. …panning across from right to left. At which point I too decided to take a quick peek over the wall into the field and see if, by chance, anything of interest lay there. For a few minutes, at any rate, the photography stopped. You never know what you might find. This is the grave of Private Cecil Carrick Wotton, killed in action on 23rd November 1916, five days after the official end to the Battle of the Somme. 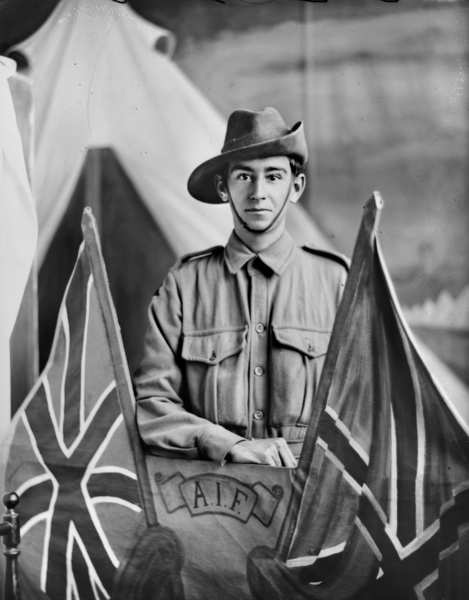 This is Private Cecil Carrick Wotton in a photograph taken at Broadmeadows army camp in Victoria, Australia, prior to his embarkation for Europe. He was 21 when the photo was taken, and nearly 23 when he was killed. And this is the little metal name tag that was once nailed to the wooden cross that stood at the end his grave after his body had been reinterred here. You never know what you might find. So here are the facts. I looked over the boundary wall for maybe ten or twenty feet. The circumference of the cemetery is about 750 feet. I spotted a small piece of metal bent completely in two in the field about a foot away from the cemetery wall, picked it up, carefully straightened it, and as I read it for a second time, I was still convinced it must be something from a piece of farm machinery. Or at least that was what my mind was telling me, as, bearing in mind the content of this website and by extension the interests of its readership, I simply refused to believe what I had found! 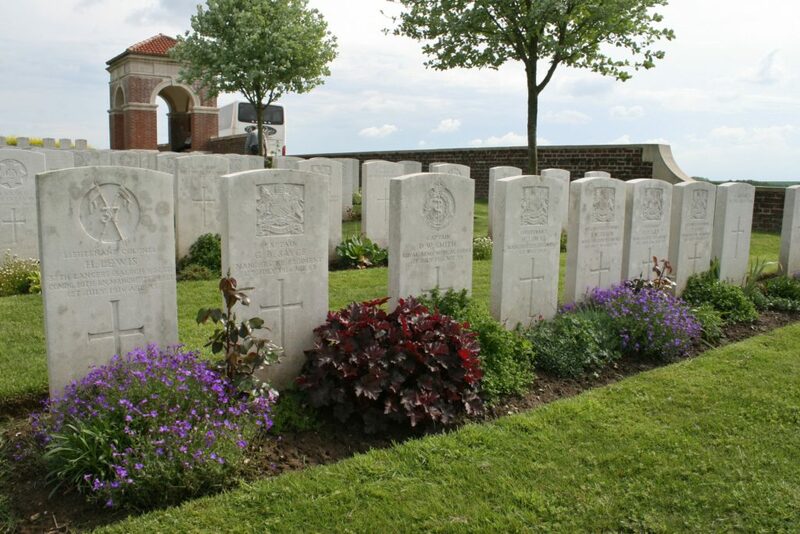 Cecil Wotton, like the Manchesters we saw earlier, was originally buried elsewhere, in his case in a German cemetery at Montauban, and now lies buried here in Plot IX Row P3 (front row, third from camera). 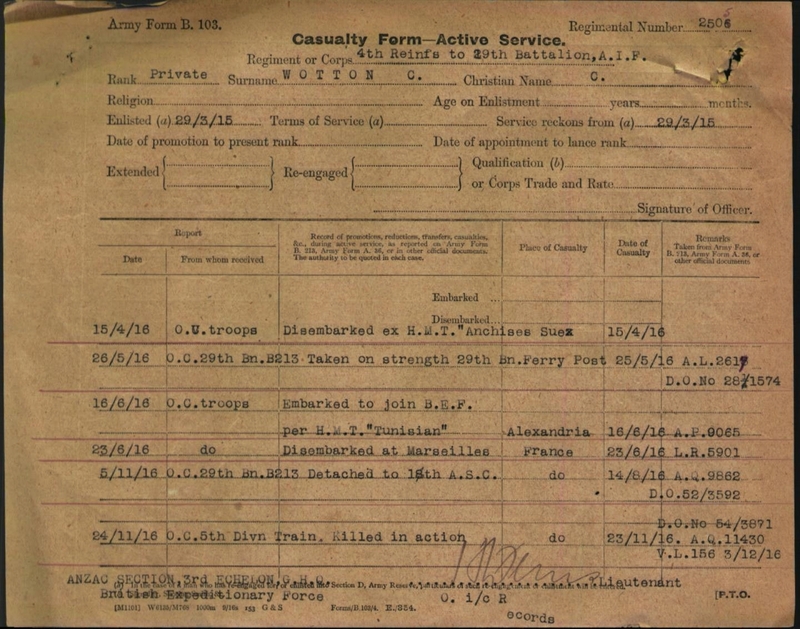 Following his discharge on 18th September 1914, Cecil returned to Townsville, where, in December 1914, having just turned 21, he volunteered for Army service, his attestation papers showing he was posted to the 25th Battalion, 7th Infantry Brigade, with the service number of 276. 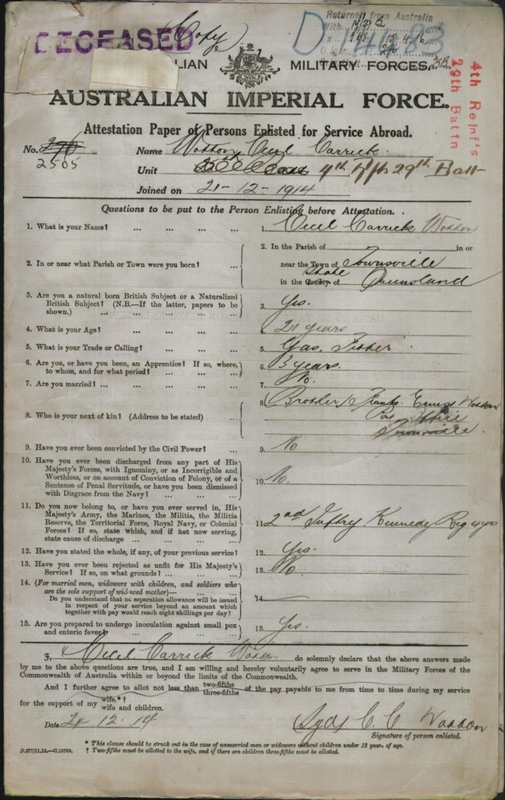 On 29th June 1915 Cecil embarked for overseas from Brisbane but, having been a naughty boy at some point (the above document contains a clue), was returned to Australia as ‘medically unfit’ in September 1915. One wonders whether this embarrassing incident saved him, for the moment, from something far worse at Gallipoli. 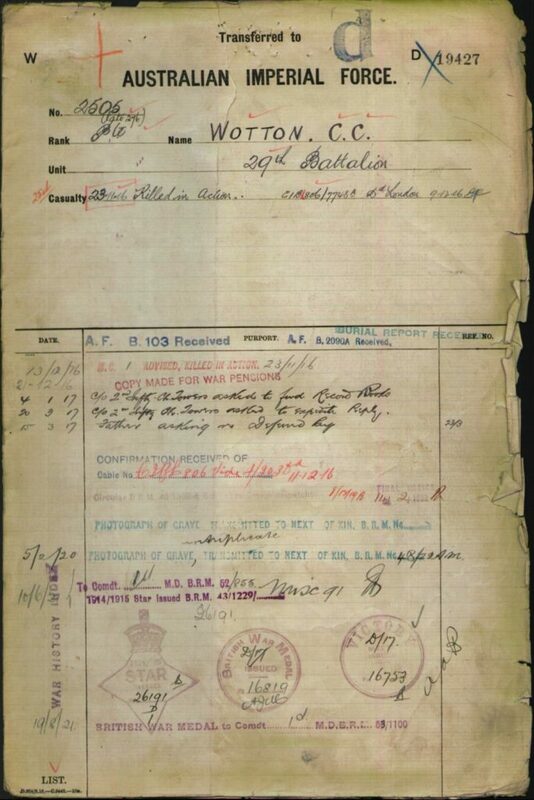 Fit once more, and with a new service number of 2505, on 14th March 1916 Cecil re-embarked, this time from Melbourne, as one of the 4th Reinforcements of the 29th Battalion, arriving in Egypt for further training on 15th April. The casualty forms (above & below) give details of his movements from then on. 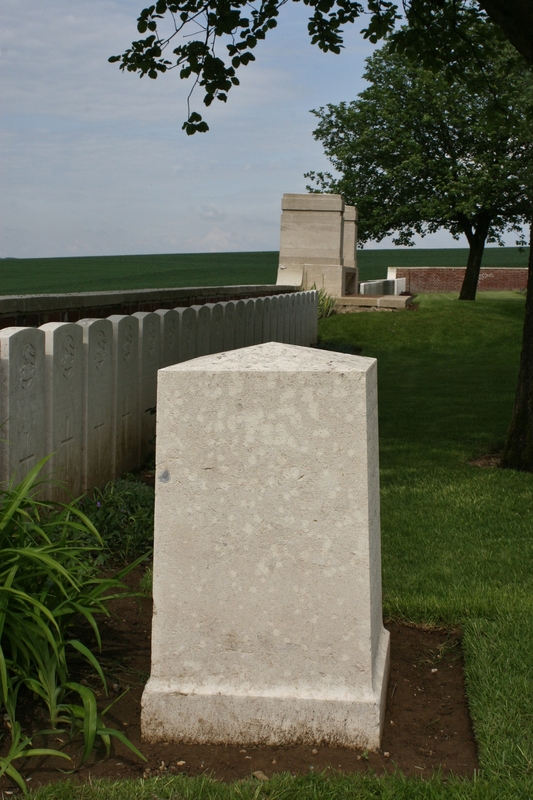 He was killed, a long way from home, somewhere within a few miles of where he now lies, on 23rd November 1916, and buried in the German cemetery at Montauban. We shall never know how he died, whether by shellfire or by bullet; all his papers say is ‘Killed in Action. In the Field’. You might be interested to know a little about the unit Cecil was with when he met his death. The 5th Australian Divisional Train, part of the Army Service Corps to which he was transferred to in early November 1916, was a transport and supply organisation whose function was to convey, using horse-drawn vehicles (the word ‘train’ being something of a misnomer), forage and rations from the point at which rail or motor transport could no longer be used, to the brigade refilling posts, from where they could be distributed to wherever required. The divisional train, which consisted of about 20 officers and 400 other ranks, was also responsible for the crucial task of transporting soldiers’ blankets and kit and the general baggage of the entire division when it was on the move, using something like 180 vehicles and some 400 horses to achieve the feat; there were no mules in a divisional train. 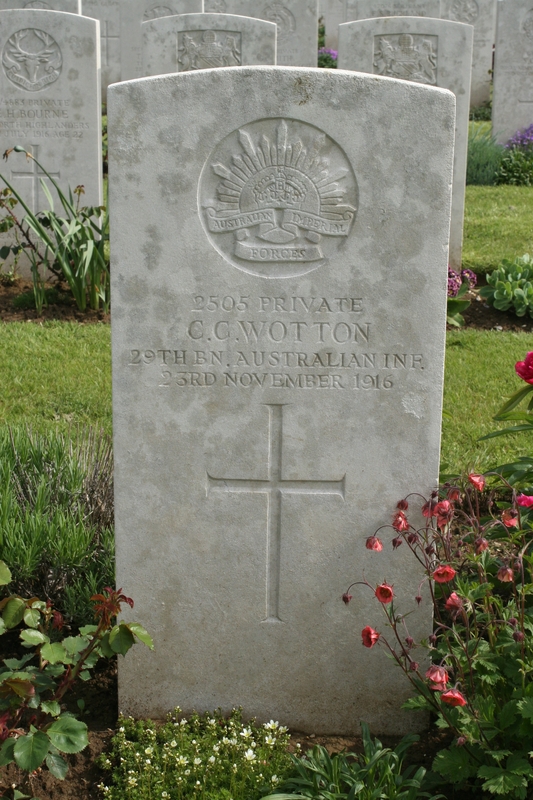 Confirmation that he was originally buried in a German cemetery at Montauban. 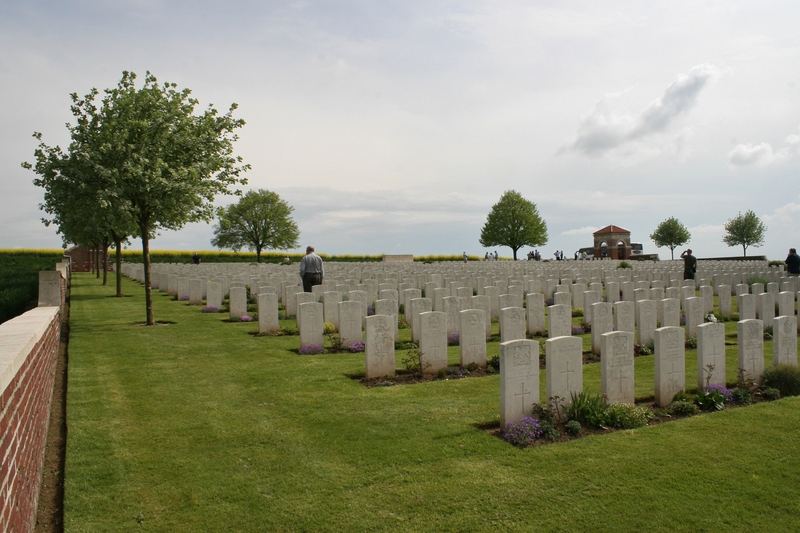 And if you look back at the earlier photograph of the row in which he is buried, you will notice that, two graves away, and nearest the camera, is the grave of Private Robert James Tranent, killed on 24th November 1916, and originally also buried in the German cemetery at Montauban. 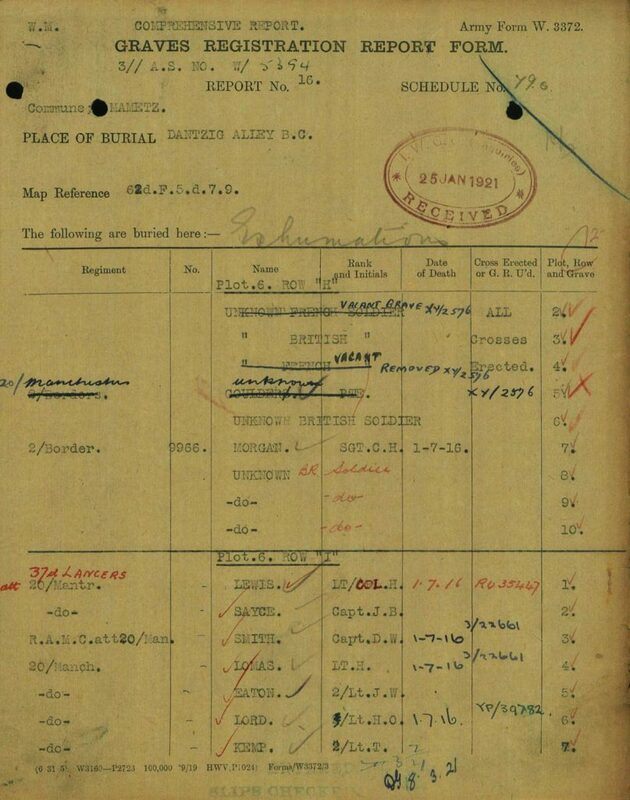 …and the graves registration report form, which states ‘All Crosses Erected’, giving us a pretty good idea of the approximate date of the metal name tag; it would seem reasonable to assume that it was in place some time prior to 25th January 1921, the date on this document. 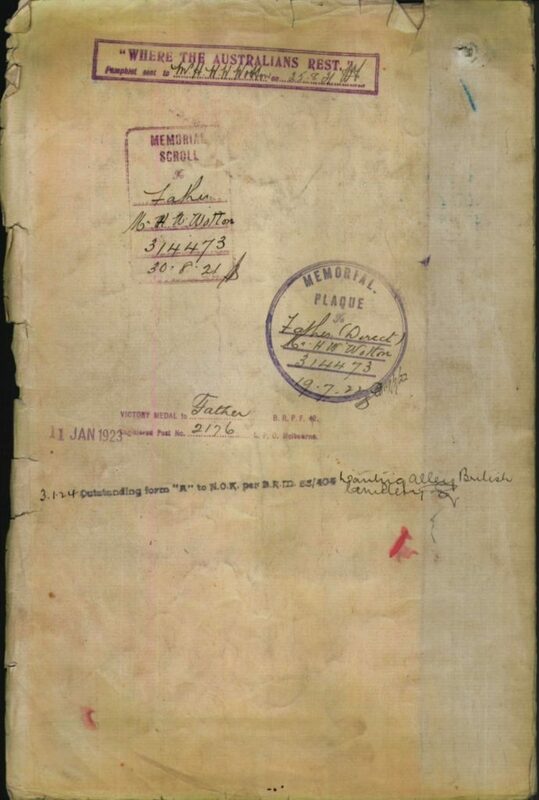 Copy of the front page of Cecil’s attestation papers, this time with ‘Deceased’ stamped at the top left. Oh, to see the photograph of the grave mentioned here. Interesting that he was entitled to the 1914/15 Star, presumably for the few days spent on Thursday Island; I am no medal expert, so if anyone feels like confirming this, I’d be grateful. 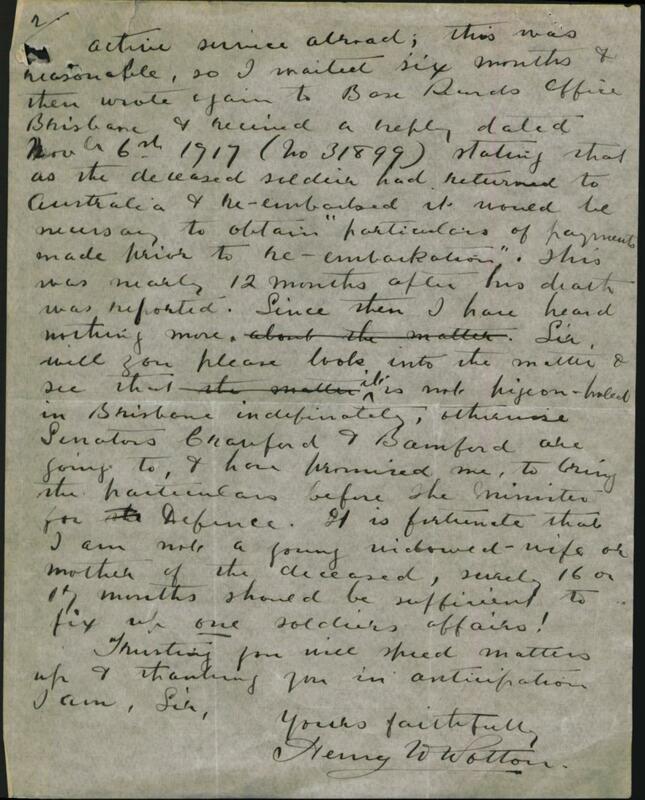 This letter from Cecil’s father Henry to the officer in charge of base records was sent in April 1918, some sixteen months after his son’s death. A cursory investigation suggests that Henry’s other sons survived the war. 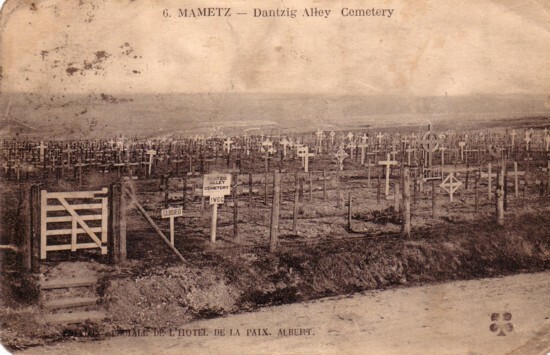 And finally, an old postcard showing Dantzig Alley British Cemetery in the early 1920s (borrowed from my friends at ww1cemeteries.com . I hope they don’t mind.). Quite a story, don’t you think? And as Avril Williams, who owns and runs the famous (and fabulous) tea rooms and museum at Ocean Villas (Auchonvillers), said to me the following day, “Well, I absolutely believe you were meant to find it”. And who am I to argue? You might also find Jeff’s comments below, in particular, of interest. Hello Chris. So does what you say agree with what I suggested, I wonder? That his short trip to Thursday Island entitled him to the medal? In other words, Thursday Island was perceived a a ‘theatre of war’? 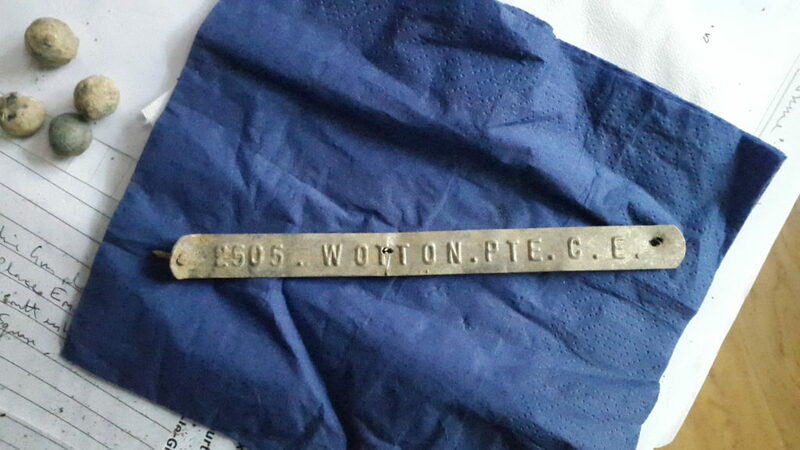 After your incredible find of Pte Wotton’s wooden cross nameplate what a wonderful in-depth piece of research you have carried out MJS. You also demonstrated the enormous amount of paperwork generated within the military and wartime. 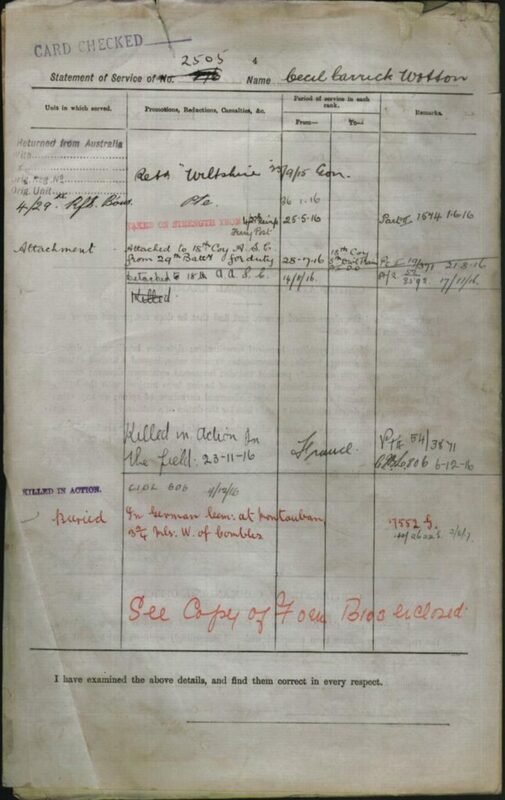 Amongst that, I almost burst my sides laughing over the conditions verified as Pte Wotton being free of in the Certificate of Medical Examination. I guess my father must have had a similar examination. I had always wondered whether battlefield burials were really reinterred and you have answered that, thank you. What a gruesome job that must have been. Your question as to Thursday Island (TI) being in a Theatre of War may be answered in the below extract from Wikepedia (I must admit I did not carry out in-depth research). I do know the distance across Torres Strait from the Australian mainland to Papua New Guinea is about 104km. Within this area are many islands known as the Torres Strait Islands and are part of Australia. Thursday Island is the major island. The closest island to PNG is a distance of a mere 4km. At the time of WW1 part of PNG was German New Guinea thus, thorough research excepted, one can presume TI and the other islands were a Theatre of War. 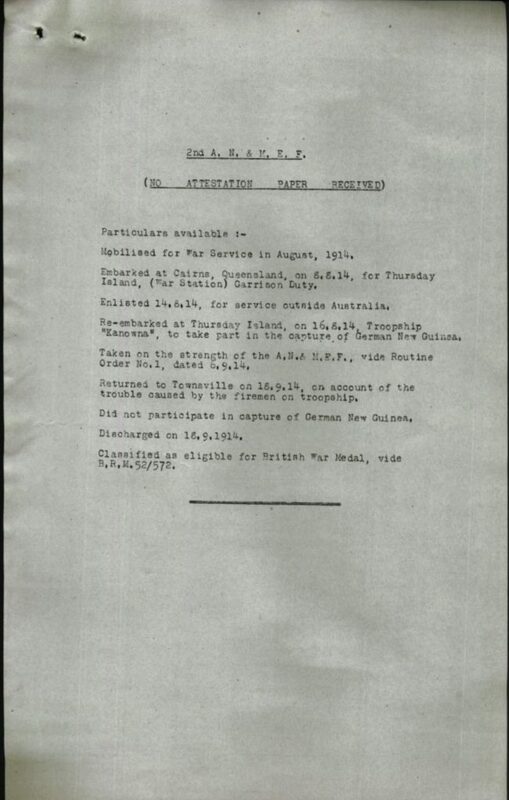 Shortly after the outbreak of war—following a request by the British government on 6 August 1914—the Australian Naval and Military Expeditionary Force (AN&MEF) began formingThe objectives of the force were the German stations at Yap in the Caroline Islands, Nauru and at Rabaul, New Britain. The AN&MEF comprised one battalion of infantry (1,023 men) enlisted in Sydney, 500 naval reservists and ex-sailors organised into six companies who would serve as infantry and a further 500 men from the Kennedy Regiment, a Queensland militia battalion that had volunteered for overseas service and had been sent to garrison Thursday Island. Merci Sid. Cecil’s papers totalled something like 60 pages! How lucky. I chose the most interesting. I feel like I’ve known him for ages. By the way, the story goes that the same gun fired the first Allied shell of WW2, but I’ve never checked. I am sure you have confirmed the Thursday Island business, and a bit more about the Kennedy Regiment in the Wiki quote. Thank you. A great read. 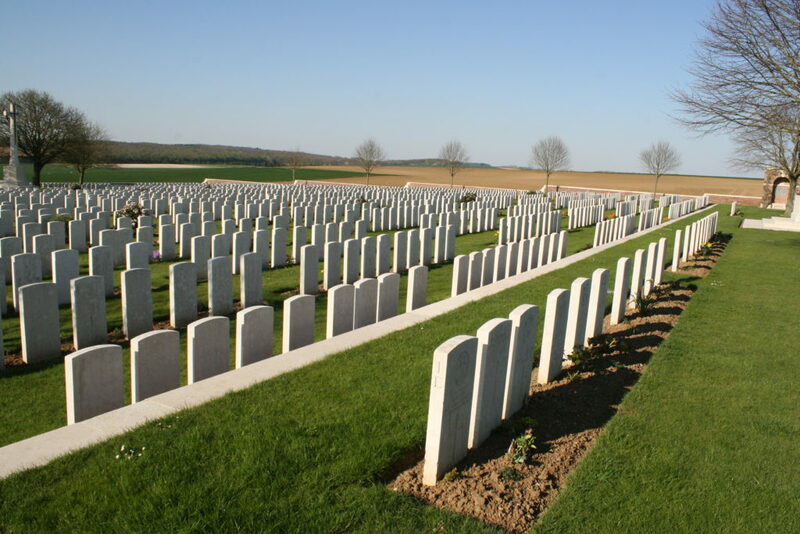 I’ve spent the best part of this afternoon reading all of your Somme write ups. It’s an area I’m very familiar with and have enjoyed your commentary immensely. 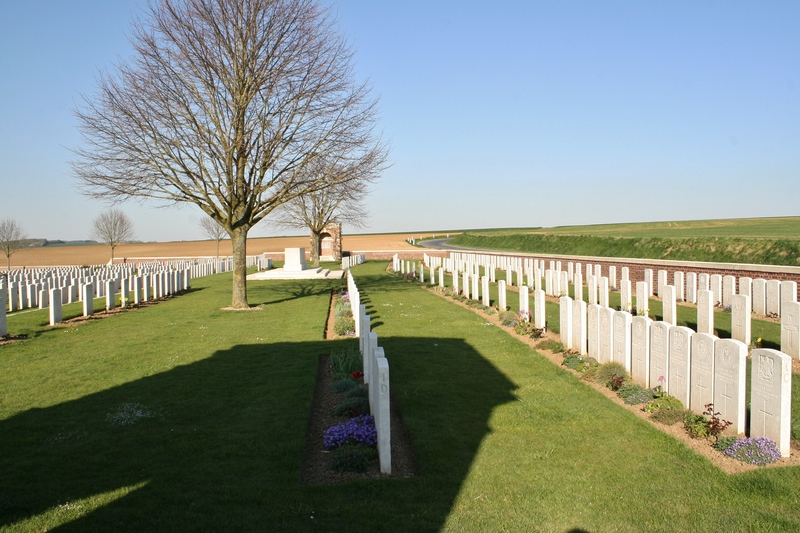 At the moment I’m not aware of any direct family connection to the area – though I have a Grt Grt Uncle who was killed at Neuve Chapelle in January 1915 who is buried at Rue-Petillon Cemetery – I paid him my first visit in June last year whilst doing The Somme again. Very interesting read, great photographs. And what better way to spend your afternoon?! Lol! Thank you very much for your kind words Anthony – particularly from someone who knows the area probably better than me! You’re a gent. Interestingly, I too was at Rue-Petillon not so long ago. 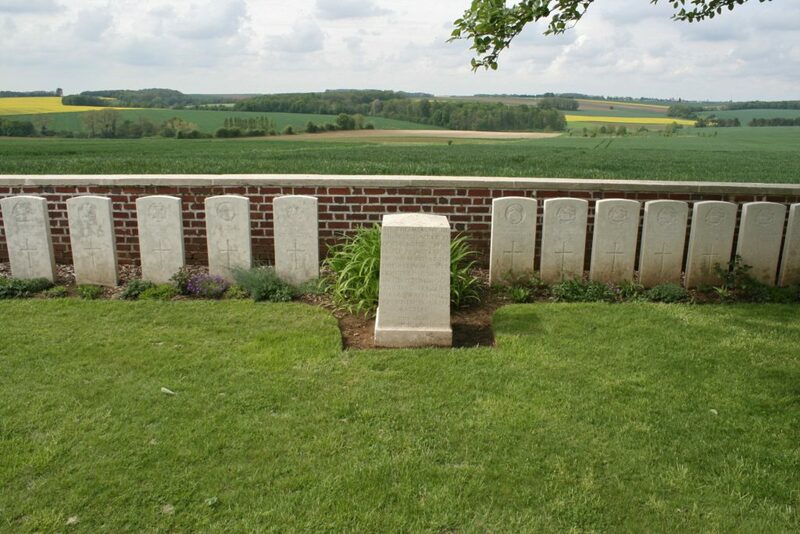 We visited all the Fromelles cemeteries and at some point I shall be featuring a tour of them here. I’d suggest that you tick one of the two boxes at the bottom of this page, and then you get informed of further posts by email, but as all my site statistics seem to have disappeared along with said tick boxes at some point today, for the moment you’ll just have to check back here occasionally instead! Sorry about that. Actually, I’m an idiot! You can still sign up for posts by clicking the Entries RSS link in the Meta menu top(ish) right of page. Amazing find. 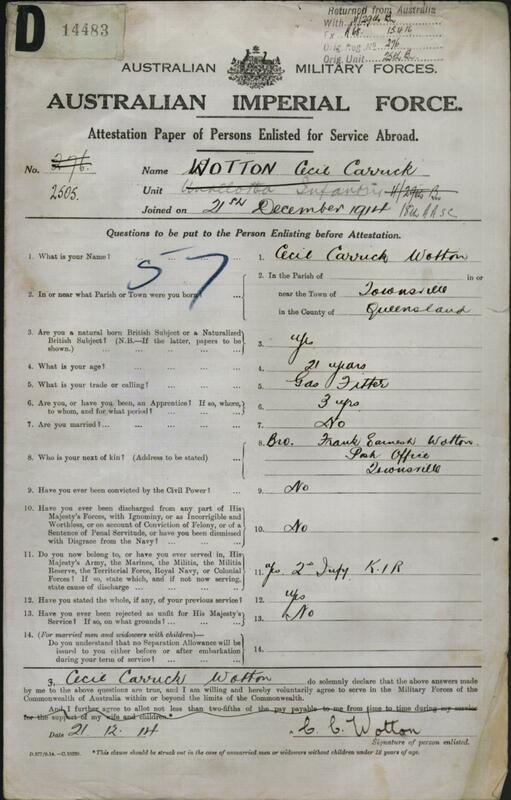 Cecil Carrick Wotton was my Grandfathers younger brother. 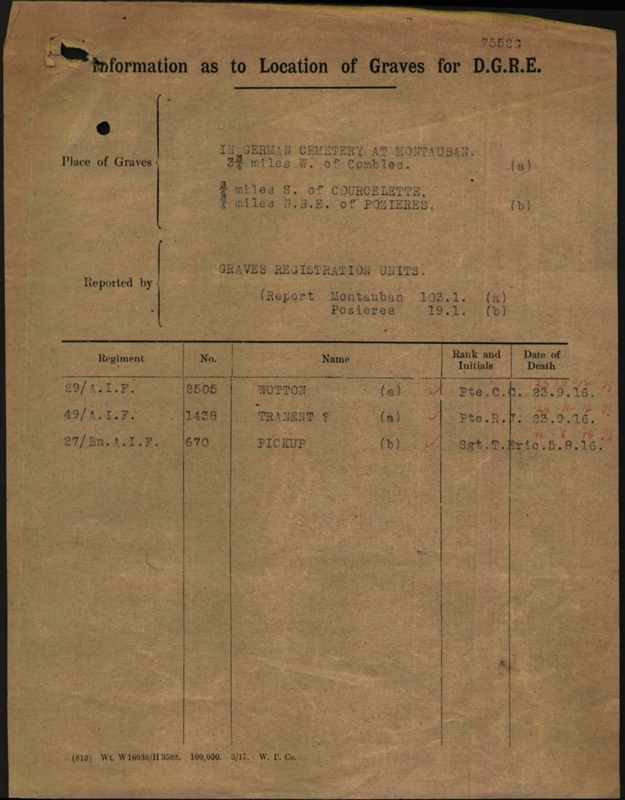 My Grandfather was Henry Fitzgerald Wotton who along with their other brother Frank all served for Australia in World War 1. 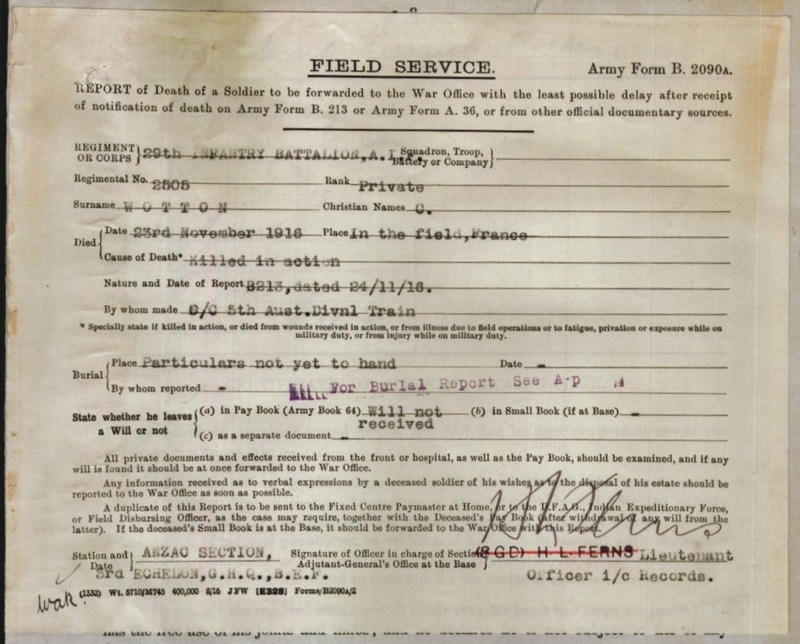 Frank lost his right eye and jaw in the battle and my Grandfather Henry was gassed in the Somme. My Grandfather died in April 1931 from lung problems. Thank you so much for sharing your find. Hello Jeff. An amazing find indeed. And I was surprised to subsequently find so much information about him – there are many more pages than the ones I included in this post. Thank you very much for taking the trouble to comment – anything more I can find out about him adds to him as a person – I’m sure you understand what I mean. And as long as this website exists he certainly isn’t forgotten. I have been doing some research over a few years now about men who died in the 20s, 30s & 40s from injuries received during their war service, as Harry did. They truly are the forgotten men. Thank you so much for your work in this Magicfingers. I think you finding his original name plate was truly meant to be. You can only imagine how the Brothers Henry Fitzgerald, Frank Ernest and Cecil Carrick all felt fighting in this conflict together. They had recently lost their Mother (my great grandmother) we think from Flu and were all fighting in this war so far away from home. Some information about their father Henry. He was a professor in music and was bought out from England in the 18 hundreds to run the Townsville Music Conserservatorium. The English wanted to install some culture from the Mother country. They lived in Stuart Street in Austral House just below Castle Hill (since demolished). My Grandfather Henry Fitzgerald (he called himself Gerald) moved to Brisbane after the war and married my Grandmother Elsie Buchanan. History on my Great Grandfather Henry is very scarce. Henry Fitzgerald and Elsie had 3 children, and only one, my Mother, is still alive. 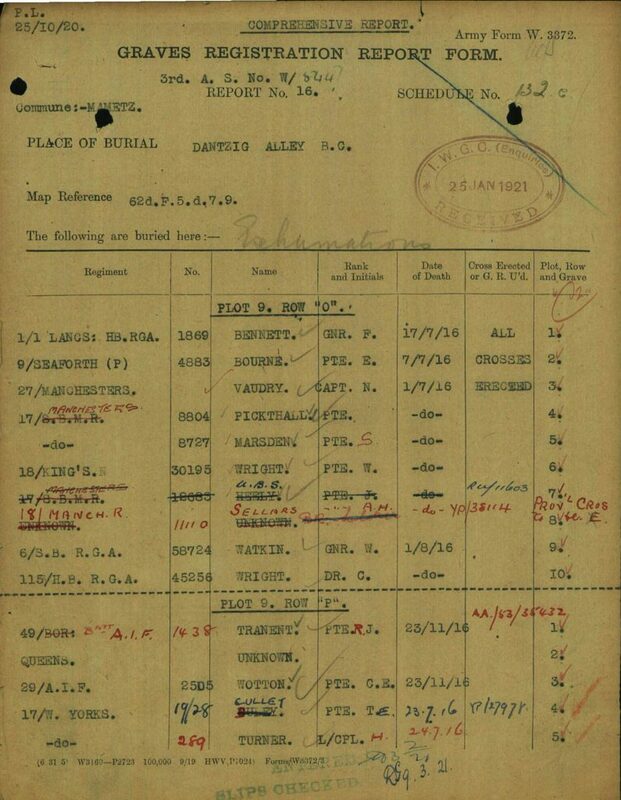 As another strange twist of fate, my Grandfather from my Fathers side Frederick John Truscott also fought in the same wars and even though they didn’t know each other, both left from Townsville. Imagine if they had of met on the battlefield? He also moved to Brisbane after the war. I never met either of them. 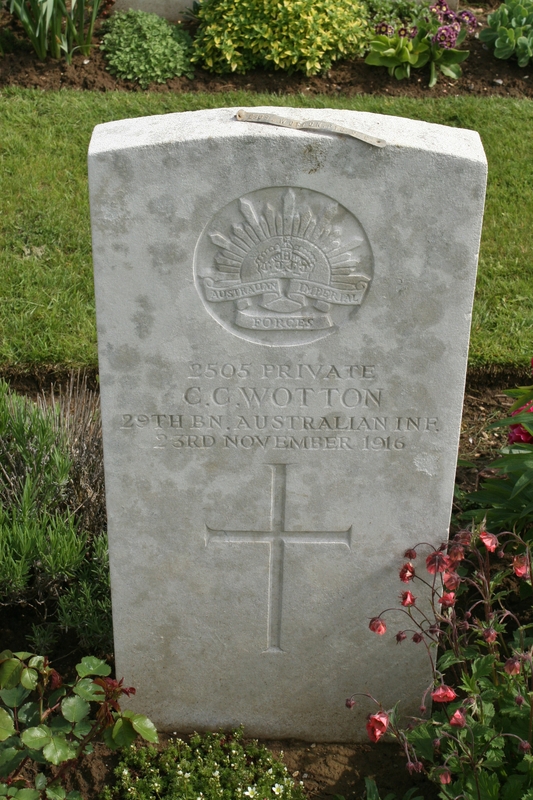 As a sub note, I should add that my grandparents called their first son Cecil obviously as a tribute to his lost Brother. A lovely gesture, I think. Jeff, once again thank you so much for the above. It makes reading Henry’s letter even more poignant knowing a bit about his background, and of course what happened to his other sons – I shall be adding a note in the post about them. I have more questions, though. We know what happened to Cecil, and Henry died in 1931, but do we know what happened to Frank after his injuries? 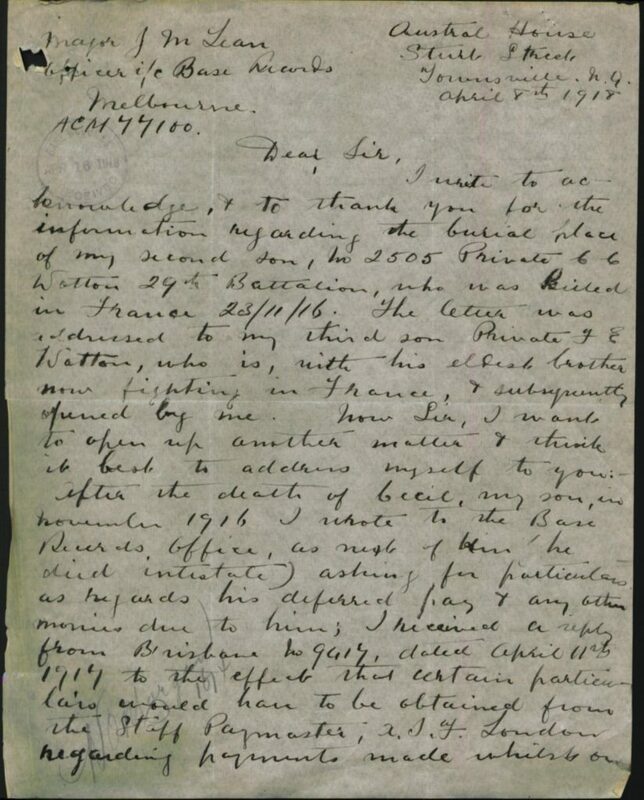 Because the letter is dated April 1918 and Henry refers to his other sons ‘now fighting in France’. Which suggests that Henry had returned after his gassing, and Frank had yet to be injured. What do you think? Did you also notice he also calls Cecil his second son, and Frank his third son. And thanks for saying it was meant to be. I do appreciate it. It does rather seem so! Hello again Magicfingers. After a long discussion with my elderly Mother yesterday I can reconfirm some of the information I have given with one notable and final correction. My mother was born in 1931 and her father actually died a day after her 4th birthday in April 1935 at Alderley in Brisbane. I am sorry for the earlier confusion on my part. 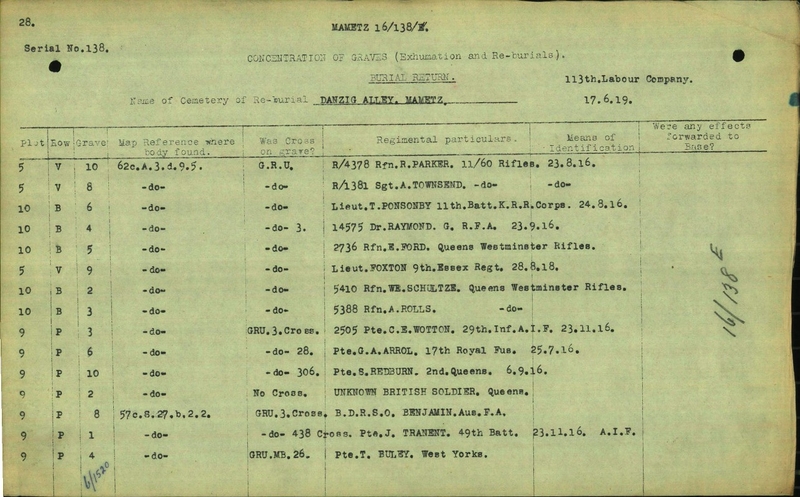 To answer your questions, I went on their war records to find their approx date of birth. Brother Frank Ernest Wotton joined in 1917 at age 21 and 9 months where as Cecil Carrick joined in 1914 at age 21 so indeed Cecil was the second son as Henrys letter states. Frank did indeed return to Australia. 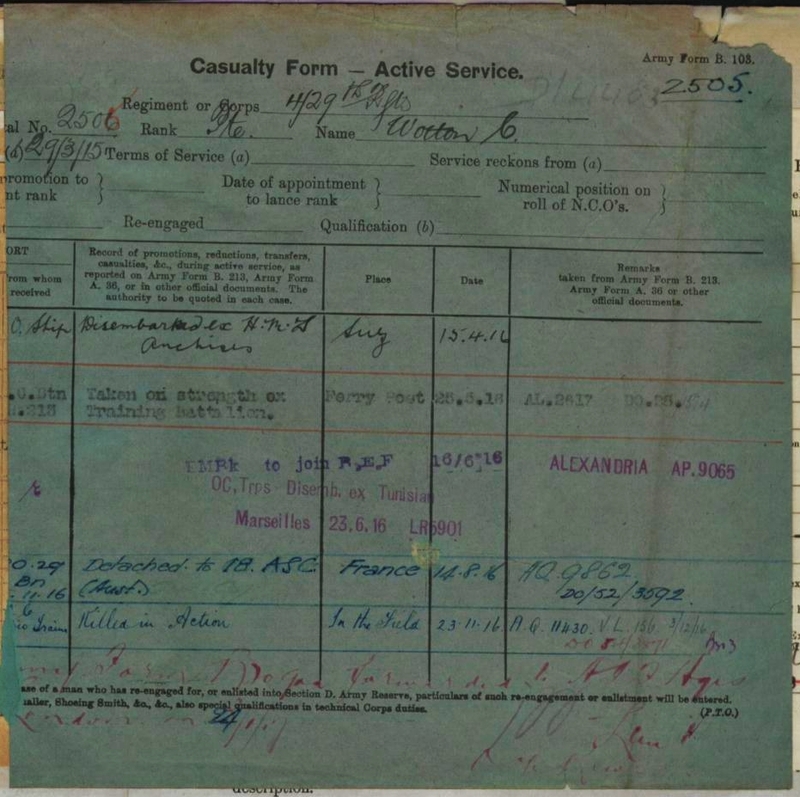 As I have pointed out, he suffered a shell burst as he was coming out of a trench in Battle of the Avre in early April 1918 and ended up having his right eye removed and a permanent jaw displacement. My mother has little recollection of him but does remember some stories. She does remember her eldest brother Cecil and older sister Joyce being taken by Train to meet the relatives in Townsville so I presume Frank returned and this is who they met. I also surmise that Frank didn’t live long after returning either. After my Grandfather, Henry Fitzgerald (Born 14th January 1893) passed in 1935, life became very hard for the family as no assistance was offered by the Government and it was only Legacy who stepped in to help. Mum remembers receiving school books and other items from Legacy which was acknowledged in front of her classmates. He worked for the Railroads after the war and also served in the local Militia. He was never totally fit after being gassed however. It does state on his Military record that he suffered from Pneumonia along with other ailments. My mother herself never met Frank or indeed her grandfather Henry William Wotton and most of the information is from hearing stories from my Grandmother. For our part we had no idea the three brothers had all served at the same time. I would love to know any more details you may have. Your finding of the name plate of Cecil Carrick has led you to find another two Diggers who just happened to be brothers who could have so easily slipped into the unknown. 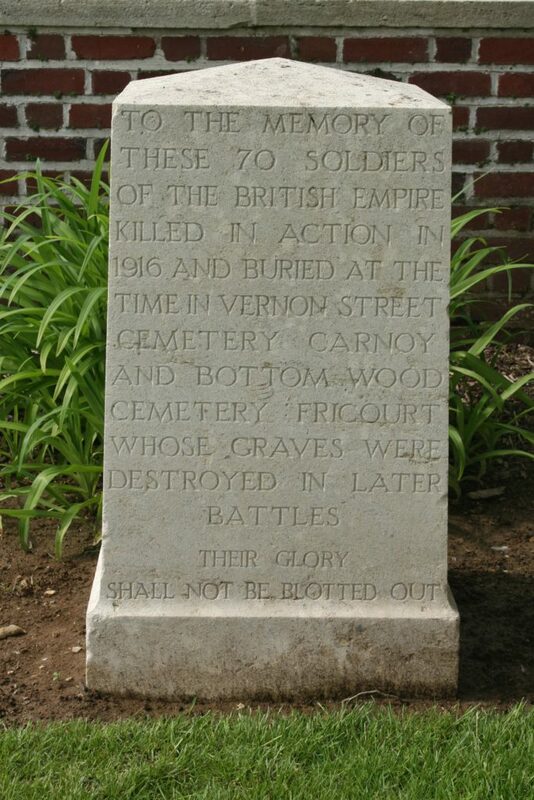 It astounds me on how our ancestors sacrificed so much and how brave they were in the face of war so far from home. Again my mistake. 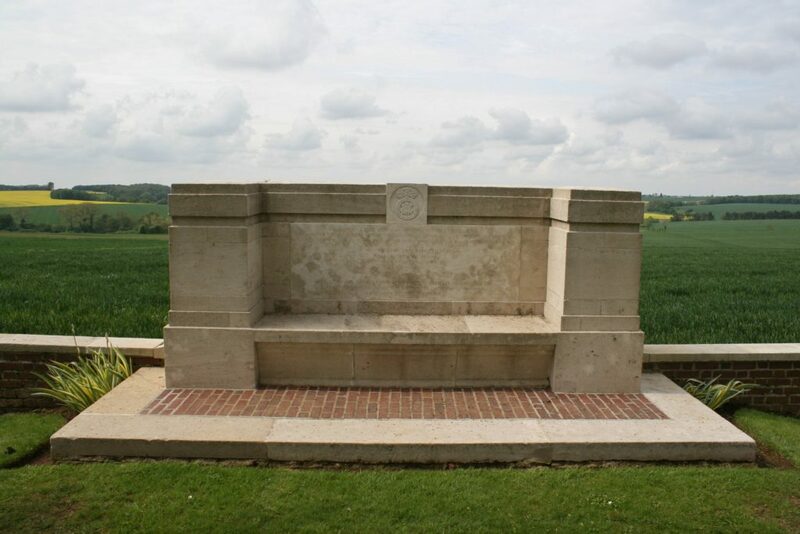 Frank was hit in the battle of Hamel in July 1918, not Avre. A fascinating story. Once again thank you for taking the trouble to type it all! I bet your Mum was interested in some bloke on the other side of the world looking into all this stuff! What documents on the three brothers have you seen, because all my information comes from the NAA, so if you have seen all those documents then I don’t have anything else to add. But there is a wealth of information in those documents anyway on all three brothers. And Henry’s reason for discharge from the army was not what I expected to see. 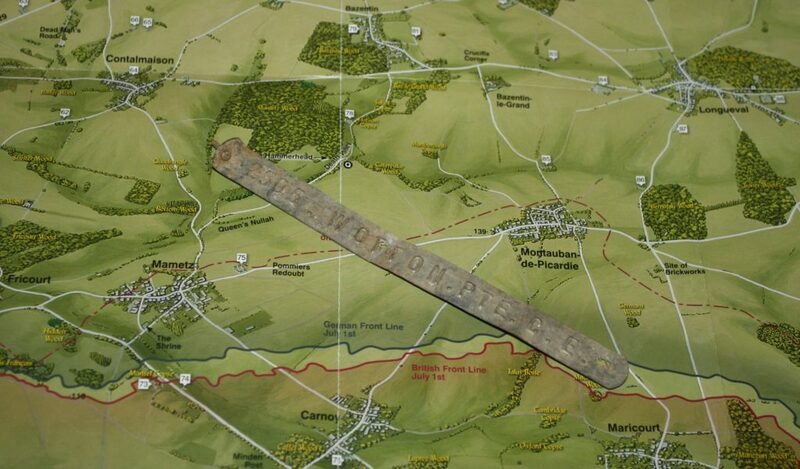 That Frank’s awful injuries were sustained in the Battle of Hamel in July 1918 is of great significance. This is the battle about which I sent you (MJS) some comment and information the other day. It was the battle planned and executed by Australian Lieutenant General John Monash and credited as being the first to turn the British tide against the Germans. The basics of his battle plan are still used to this day. The John Monash Museum was officially opened on 25 April 2018 (ANZAC Day) at Villers-Bretonneux. Franks family would be rightfully proud that he fought in this historic battle. Bravo Frank! Thanks Sid. Most kind. And well said (the Frank reference). The book I am currently reading includes the actions at le Hamel, so I shall find out (even) more when I reach that section. Yes, we have mentioned him before, have we not? By the way, next post, scheduled for Saturday, another of your men comes under the spotlight, Sid, although not his best day (and he certainly had a few of them), I’m afraid. I’m such a tease. Hello everyone. All Truscott’s originally came from Cornwall in the UK. Namely around St Austell. I have been able to go back several generations. Always being inspired by Bluey Truscott, I went back to see if I could get a direct family link with no success. The thing is Bluey had the typical Truscott appearance and demeanour although there is no sign of red hair in my family line. 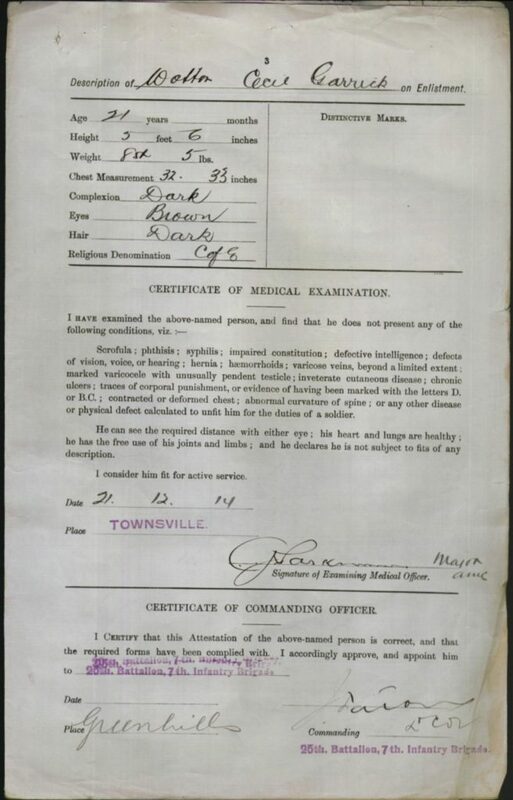 My Grandfather did recuperate at Bath before returning to Townsville. Went through Truro today! Just thought I’d mention it. Melbourne Football Club (the Demons) remembered a former club hero last week during a moving visit to Karrakatta cemetery ahead of the AFL preliminary final against West Coast. Club chairman Glen Bartlett paid tribute to former dual premiership player Keith “Bluey” Truscott when he visited the player’s grave. Truscott, for whom the club’s best and fairest award is named, won premierships in 1939 and 1940. 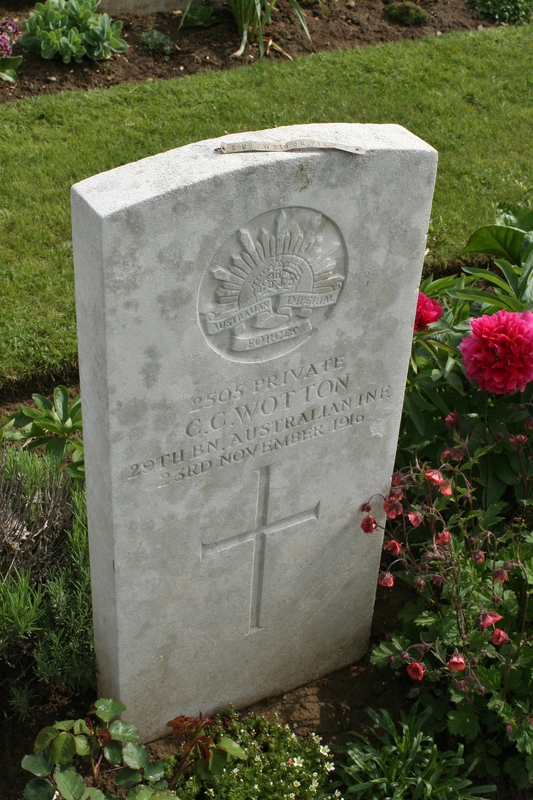 He was killed in a flying accident off Exmouth Gulf, aged 26, in 1943. The Demon’s website said North Melbourne fan Graham Reynolds visited the grave with Mr Bartlett after reminding Melbourne it was the 75th anniversary of Mr Truscott’s death. but his body was recovered and he was buried in Perth,” Mr Bartlett told the website. “Graham thought it would be great if we could do something on our visit here [to Perth] to acknowledge that. “He brought along someone he met recently, Ian MacPherson, who is a passionate Melbourne supporter. 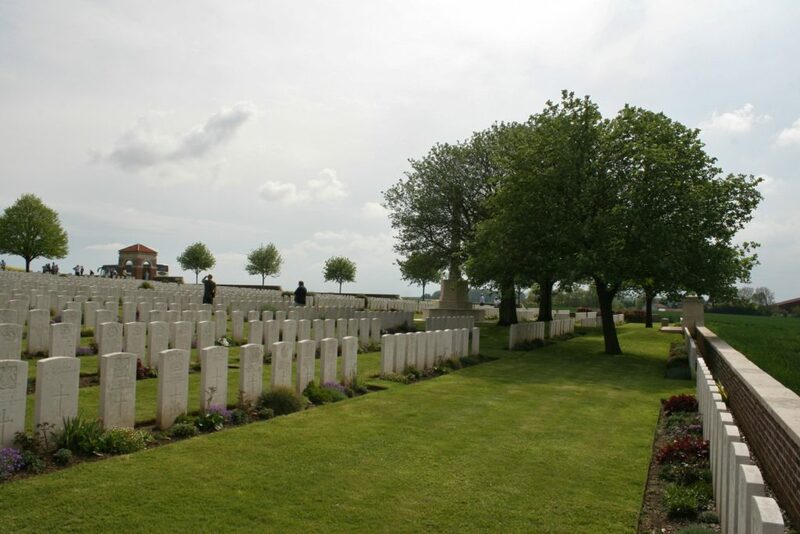 He said Mr Truscott’s grave was in a fantastic location in the war service part of the cemetery. The commemoration was very moving and they had left some flowers and a Melbourne Football Club scarf. Bartlett with Graham Reynolds, left, and Ian MacPherson, right. PS: Western Australia’s West Coast Eagles won both the AFL Preliminary and Grand Finals – 2018 Premiers!